Note: Race extended 10 laps past its scheduled 300-lap distance due to a green-white-checkered finish. ● Custer started ninth, finished fifth and earned six bonus points. ● Piloted the Haas Automation Ford Mustang in and around the top-10 until the yellow flag waved on lap 70. ● During the caution, he reported tight-handling conditions, but elected not to pit in order to maintain track position. ● Restarted in first and kept the Haas Automation Ford inside the top-five before the stage ended. ● After the stage concluded, Custer pitted for four tires, fuel and air pressure and chassis adjustments. ● Custer started 10th, finished 14th. ● Custer drove the Haas Automation Ford back into the top-five in the opening laps. ● Ran inside the top-10 until a lap-104 caution and noted loose-handling conditions. ● Crew chief Jeff Meendering radioed Custer to the pits during a lap-159 caution for four tires, fueland chassis adjustments. ● Custer restarted in 13th place and remained outside of the top-10 before the stage concluded. ● Custer started eighth, finished fourth. ● Custer was forced into the wall on lap 178, pushing him outside the top-10. ● During a caution on lap 259, Custer pitted for four tires, fuel and chassis adjustments to correct loose-handling conditions. ● Custer powered the Haas Automation Ford into seventh place before he was forced into the wall again on lap 272, falling back to 11th. ● Custer’s long-run speed proved to be valuable when he battled back to seventh with nine laps to go. ● After a caution was brought out with three laps remaining, the Haas Automation Ford driver climbed to the third position and was passed for fourth place by inches just as the checkered flag waved. 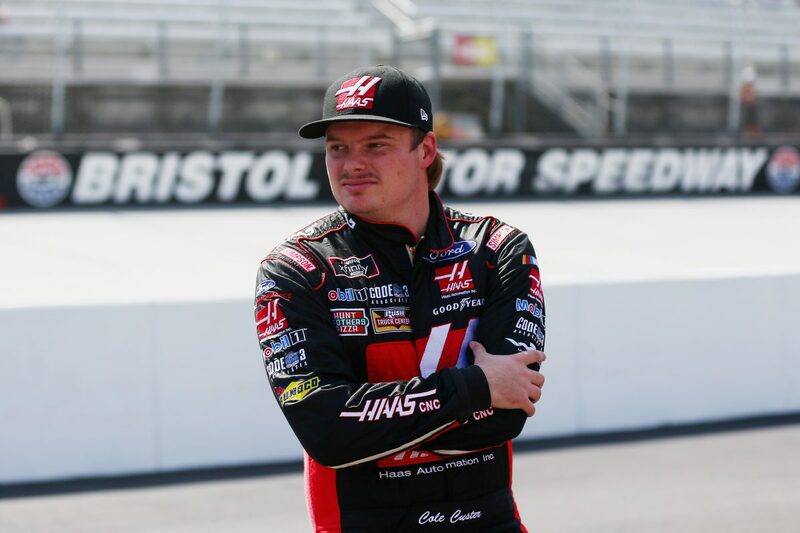 ● Custer scored his eighth top-five of the season and his first at Bristol. It was also 18th top-10 of the year and third top-10 at Bristol. ● Custer earned six bonus points in the Food City 300 at Bristol. ● Custer led once for five laps. ● Eight cautions slowed the race for 59 laps. ● Kyle Larson won the Food City 300 to score his 12th career Xfinity Series victory, fourth of the season and first at Bristol. His margin of victory over second-place Christopher Bell was .434of a second.